It's rare for me to be teary-eyed proud to be Filipino. It happened to me during the first EDSA revolution when I was 10 years old. Probably, during the EDSA Dos as well. 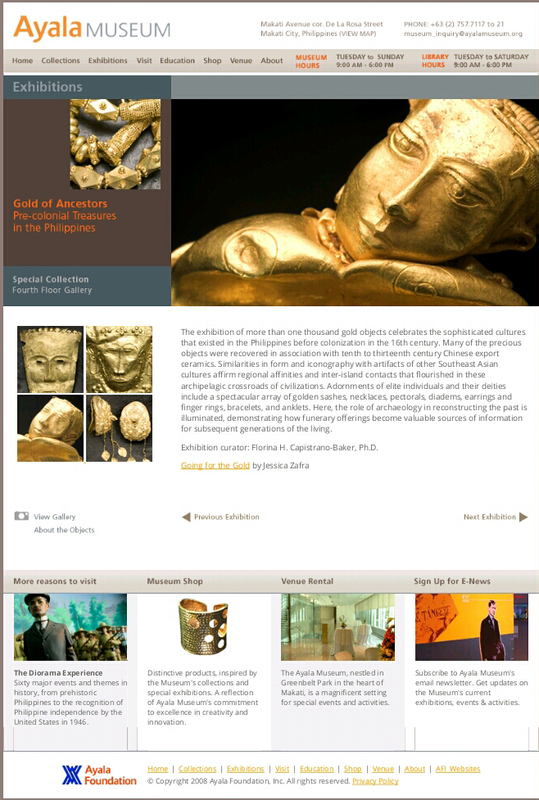 I have to say that the permanent exhibit at the Ayala Museum titled "Gold of Ancestors: Precolonial Treasures in the Philippines" had that kind of effect on me. While walking through the exhibit hall, I had an unexplained lump in my throat. I was nervous, and teary. It is not because of the monetsry value of the kilos gold in front of me but because of the significance of what I was seeing to the history of the Filipino people. I felt sad for what we had lost and forgotten and simultaneously happy for what I learned about my ancestors that day. Unlike the legend of Princess Urduja and the Code of Kalantiaw, at least, this legend is set in gold. Who would have thought that such a developed and sophisticated culture existed in the Philippines before the Spanish arrived in 1521? Yeah, I know we had datus, balangays, and bayanihan but this is another level of culture altogether. We were not the salvages that the conquering Europeans saved but a civilization that was ravaged and forgotten. I think we owe it to the next generation to increase research activities focusing on this lost time. This exhibit should be seen by every Filipino.